Location: 20 km from Satara city. Best time to visit : July to November. Chalkewadi Wind Mills Project (It is near from Thoseghar). 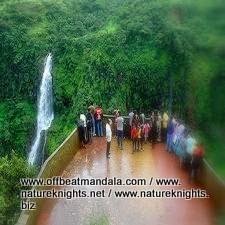 This waterfall is at driving distance from Mumbai, Pune, Satara, Mahabaleshwar and Panchgani. A 20 km drive from Satara city towards beginning of Konkan takes you to a heart stopping majestic site of a 1000 feet waterfall called Thoseghar it is named after its village. Thousands of people come from all over Maharashtra to visit this place during monsoon. You will experience the heavy rain fall here. You can get a very clear view of this falls from the a newly constructed Platform to stand. For the adventurous ones can enter in the Valley and see where exactly the water falls except the Rainy season (due to heavy rainfall).This place is full of Natural beauty and pleasant climate to experience this you need to visit Thoseghar in Rainy season. There are some hotels where you can enjoy a food(especially Non-veg) after enjoying the mighty of water fall. Thoseghar waterfalls breaks the calmness of the surrounding with a loud roar as it falls down over a 1000 feet. Besides waterfalls this region also has a clean lake, dark woods and highly hilly region. You can enjoy various small waterfalls here which are about 15-20 meters high and one of around 500 meters high. Thoseghar is really a wonderful place where you can enjoy the beauty of the nature. The best season to visit Thoseghar and enjoy is between July to November. You can reach Thoseghar with state transport buses or via your own vehicle. The road direction and milestones direct the way to Thoseghar. On the way to Thoseghar you will see Parali dam and Sajjangad. The route to Thoseghar from Satara was very scenic (even in September). The road goes along the edge of the cliff giving you wonderful views all along the way. You have to climb down a short distance before you reach the view point from where you will be able to see the thoseghar falls. The walk is short, So, the best time would be right in the middle of the monsoon. Near thoseghar, the Chalkewadi windmill farms is an interesting place to see around Thoseghar, but no one never realised that the whole area would be infested with huge, realluhuhe windmills. Easily, the biggest ever seen, you can see hundreds of them all over the hills. The windmills were much bigger than what we thought would be.